Workspace Technology will 'create datacentre technical space' through planning, design and a range of data centre construction services. 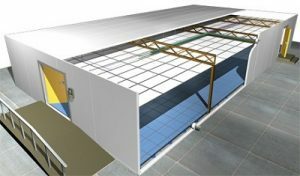 When building a new datacentre or evaluating an existing site facility, it is necessary to understand the risks associated with geography, physical building infrastructure, and location of network critical facilities within any proposed building environment, as well as calculating a suitable room size. Our experienced and qualified consultants will advise on your required room sizes based on current and future cabinet rack footprint requirements and associated cabinet energy demands as part of our Data Centre Construction and Management Service. A balance will be made depending on power calculations between actual I.T equipment, servers and associated hardware floor space and that required for effective temperature cooling such as air conditioning and power related equipment. Throughout the construction process we work in partnership with clients to ensure compliance with appropriate Building Regulations and Planning Approvals. Workspace Technology provides a range of construction services as part of our one stop shop datacentre solutions offer to create the 'technical space' ready for fitout. Traditional Data Centre Construction Services - We undertake builders' works, partition walling, internal joinery, ceiling grids systems, final decoration and finishes to create high availability datacentre environments. Data Centre Raise Access Floors - We undertake installation of raised access floor systems using heavy duty panels (4.2KN per 25mm2) suitable for Data Centre and Server Room environments. Panels are manufactured with pre-bonded antistatic vinyl finish and neoprene edge designed to seal the floor to prevent air loss. As part of our datacentre raised access floors construction services we offer a range of grille tiles, floor grommets, and airflow baffle systems to ensure maximum airflow efficiency for the cooling systems. Click here to view our Raised Access Floor Datasheet. Composite Panel Systems - Workspace Technology offers a range of pre-engineered composite panel systems ideal for data centre environments. Options include standard 60 minutes and 90 minute rated systems as well as CPNI approved ModuSec, which provides enhanced protection against water, fire, heat and physical attack. Modusec Composite Panel System - ModuSec is the UK's leading data centre and server room modular construction product. The system provides a clean and fast alternative to traditional construction techniques to deliver enhanced protection for data and server equipment. External Construction Services - As part of a one-stop datacentre installation we will undertake structural calculations and associated civil works as required to support external plant installations including plinths, ducts and custom GRP housings designed to protect external equipment.